You are here: Home / Jewelry / Earrings / Winter chill: ice blue statement earrings. Winter chill: ice blue statement earrings. It’s almost December, which (for many people) means parties galore. It’s always hard to figure out what to wear to holiday themed events without being overly on-the-nose, isn’t it? Don’t worry – these icy blue statement earrings and I are here to help you. 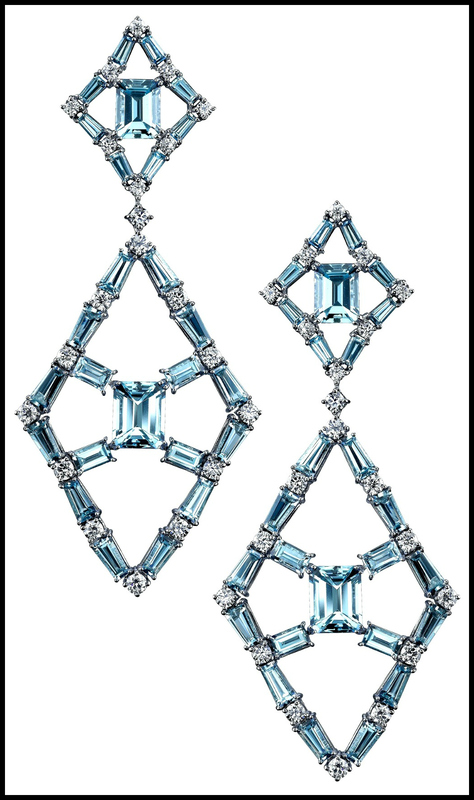 These Miiori sapphire and diamond earrings would make you the ice princess of any winter ball. These beauties sparkle with 14 carats of blue sapphires and 11.69 carats of diamonds in titanium and white gold.I can’t resist the color combination here: the chill blue platinum studded with chunky sapphires and frost-white diamonds. And the modern, sinuous lines are to-die-for. Like so many of the colorful earrings I admire, I think these frosty blue statement earrings are just begging to be worn by someone with a head of thick, dark hair like mine. But I might be biased, due to my love for bright earrings. Behind door number 2, we have the “Blue Queen of Diamonds” earrings (which is not a name I made up, although I’d be proud if it was). They’re regal indeed, with a beautifully clean geometric design that incorporates 19.83 carats of blue topaz and 2.69 carats of diamonds set in 18k white gold. The colors and shapes in these babies reminds me a bit of some of my favorite aquamarine Art Deco pieces, but with a modern flair (and in topaz). 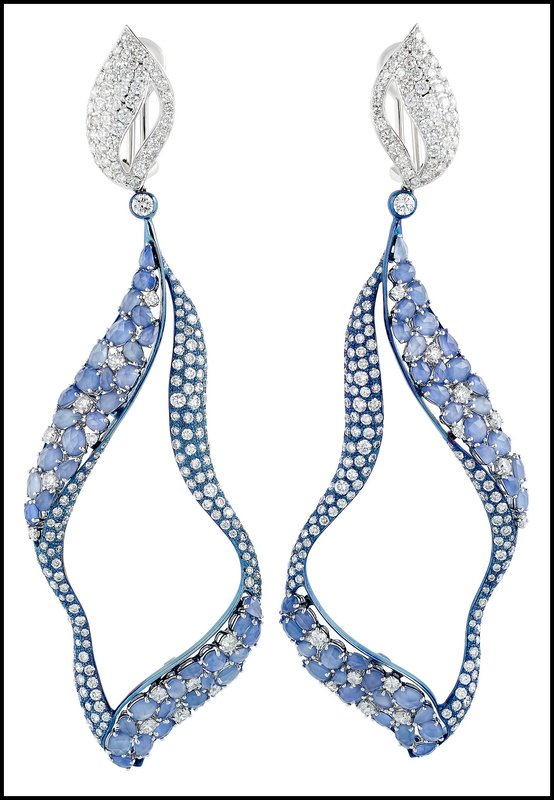 What would you wear with a pair of wintry blue statement earrings like these? Which of these would you choose if you could only have one? All images and info in this post are thanks to the lovely Caroline at Communique LA.